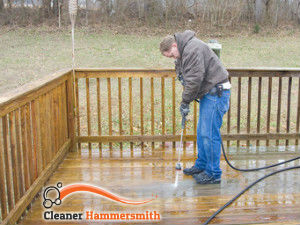 If your patio and driveway have gotten dirty over the years and you have finally decided to get them professionally cleaned, call our company any time and book our patio cleaning service, because you will not find a better one anywhere in Hammersmith. What is more, we are offering you our perfect professional patio cleaning service for a very cost effective price, so call us now and take advantage of our offer. We would be happy to clean your patio and driveway for you. We assure you you will not regret choosing our company. We will prove to you that we truly are the best cleaning services provider in town. What you can expect from our patio cleaning service is professionalism, competent customer service, efficient and comprehensive patio cleaning service, and very convenient and affordable prices. Our cleaners can clean patio, driveway and decking, regardless of their material – concrete, tarmac, natural stone, re-constructed stone, paving slabs, etc. With our state of the art pressure washing machines nothing is impossible. We will clean moss and algae, we will remove dirt and nasty stains, even oil and tyre marks will be gone for good. Trust us with your patio and driveway cleaning, and we will make sure they are left sparkling clean. We assure you you will notice the difference right away. Hire us for regularly maintenance, and we will keep them in their best state possible. 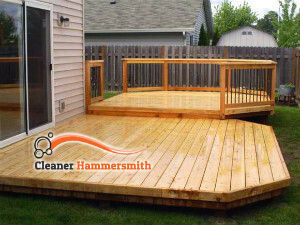 We are the best patio cleaning service in Hammersmith, W6, call us now.